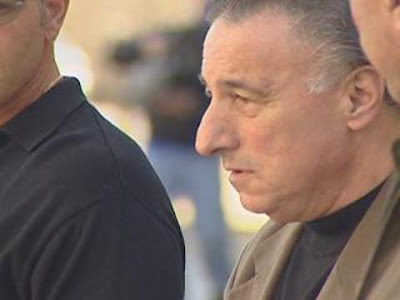 The jury in the racketeering trial of mob boss Joe Ligambi and six co-defendants headed home this afternoon after completing a tenth day of deliberations without reaching a verdict in the high profile case. What's more, for the first time since deliberations started on Jan. 8, the anonymously selected panel did not ask a question or request to hear a tape that had been played during the 10-week trial. Ligambi and four co-defendants who are being held without bail wait each day in a secured lock-up in the federal court building several floors below the 15th floor courtroom where the trial was held and where deliberations are taking place. "They're guardedly optimistic," one defense attorney said as today's session drew to a close. "The feeling is, if this were a slam dunk case for the government they would have come back with verdicts already." The fact that the panel asked no questions and remained holed up all day discussing the case could indicate that jurors have all staked out their positions and are now debating amongst themselves. With seven defendants and with assorted charges, it's conceivable that the jury has reached consensus on some, but not all of the charges and that it could eventually come back with split decisions. All seven defendants, Ligambi,73, mob underboss Jospeh "Mousie" Massimino, 62, mob capos Joseph "Scoops" Licatga, 71, and George Borgesi, 49, mob soldiers Anthony Staino, 54, and Damion Canalichio, 42, and mob associate Gary Battaglini, 51, have been charged with racketeering conspiracy. That overriding charge is tied to assorted counts of gambling, loansharking and extortion that are detailed in the 52-count indictment first handed up in May 2011. Ligambi also faces an obstruction of justice charge and a fraud charge tied to the allegation that he and his family received over $220,000 in medical benefits while he held a no-show job with a South Philadelphia trash company. In theory, the defendants could be convicted of separate offenses, but the jury could decide -- as the defense seemed to argue -- that none of the acts were part of a broader conspiracy. Or the jury could decide that some defendants were involved in the conpsiracy and others were not. Whatever the verdict, the panel has now deliberated longer than the last major mob racketeering trial. That case, in 2001, lasted three months. Jury deliberations began on July 14 and ended on July 21. The results were split with mob boss Joseph "Skinny Joey" Merlino and his co-defendants found guilty of racketeering charges tied to gambling, extortion and the receipt of stolen property. The jury found that the government had failed to prove more serious murder, attempted murder and drug dealing charges that were included in the racketeering charge. Borgesi, Ligambi's nephew, is the only defendant to be tried in both cases. He was sentenced to 14 years after the 2001 trial. He was about to be released to a halfway house in May 2011 when he was indicted with Ligambi and the others in the current case. He is one of five defendants being held without bail. Staino and Battaglini are the only defendants who are free on bail. Jury deliberations are to resume tomorrow. George Anastasia can be contacted at ganastasia@verizon.net.